Is there a cosier book in existence than The Wind in the Willows by Kenneth Grahame? 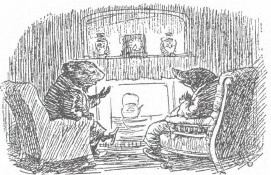 Written in 1908, the enviably close friendship between Rat and Mole, the comfortably paternal authority of Badger, and, most of all, the riotous adventures of Toad have been entertaining readers for over a century – though it was not, as A.A. Milne will remind you, as popular initially as it truly deserved to be. Containing some of the most practical advice ever written down (‘Believe me, my young friend, there is nothing – absolutely nothing – half so much worth doing as simply messing about in boats’), there are few reading experiences more comforting than opening the book for the umpteenth time on Mole’s spring cleaning, knowing that within a few lines he will abandon his whitewashing and head out into the wide world, where his soul mate the Water Rat awaits him. It is an enviable relationship (as well as another reminder of how much I love Manguel). The floor was well-worn red brick, and on the wide hearth burnt a fire of logs, between two attractive chimney-corners tucked away in the wall, well out of any suspicion of draught. A couple of high-backed settles, facing each other on either side of the fire, gave further sitting accommodation for the sociably disposed. In the middle of the room stood a long table of plain boards placed on trestles, with benches down each side. At one end of it, where an armchair stood pushed back, were spread the remains of the Badger’s plain but ample supper. Rows of spotless plates winked from the shelves of the dresser at the far end of the room, and from the rafters overhead hung hams, bundles of dried herbs, nets of onions, and baskets of eggs. It seemed a place where heroes could fitly feast after victory, where weary harvesters could line up in scores along the table and keep their Harvest Home with mirth and song, or where two or three friends of simple tastes could sit about as they pleased and eat and smoke and talk in comfort and contentment. The ruddy brick floor smiled up at the smoky ceiling; the oaken settles, shiny with long wear, exchanged cheerful glances with each other; plates on the dresser grinned at pots on the shelf, and the merry firelight flickered and played over everything without distinction. Nature’s Grand Hotel has its Season, like the others. As the guests one by one pack, pay, and depart, and the seats at the table-d’hôte shrink pitifully at each succeeding meal; as suites of rooms are closed, carpets taken up, and waiters sent away; those boarders who are staying on, en pension, until the next year’s full reopening, cannot help being somewhat affected by all these flittings and farewells, this eager discussion of plans, routes, and fresh quarters, this daily shrinkage in the stream of comradeship. The Wind in the Willows is the perfect before bed book, whether you’re reading it to someone else or just to yourself. The chapters have definite endings; there are no messy cliffhangers leaving you uncomfortably anxious. A number of the chapters can be read independent of the rest of the novel – particularly the adventures of Toad – which is, I suspect, how many readers choose to reread the book. 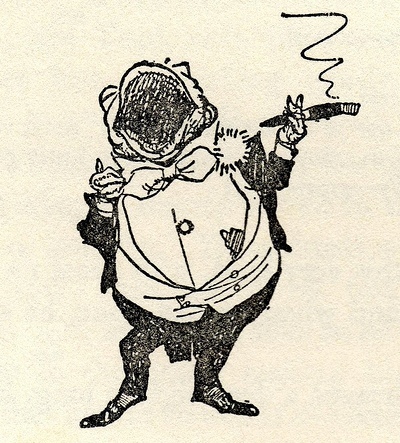 A.A. Milne, for instance, adored Toad’s bits so much so that he turned them into the play Toad of Toad Hall (which I currently have checked out from the library and am eager to read). But, much as I love Toad, I could never do without Badger’s reassuring presence or the inspiring example of Rat and Mole, who together are able to embrace the world around them with a confidence they never could alone. It is as close to perfect, I think, as a book can be. That’s a wonderful review of one of my favourite books. From the opening sentence to the last, it always has me entranced. I love this book and I love Mole, who finds the courage to throw everything to the wind, leave the spring cleaning and go out and discover the world. Interestingly, this is one of very few books that have been successfully adapted for the stage. There is one terrible version but the early one by Milne and the more recent one by Alan Bennett are both excellent. I noticed yesterday that one of our local theatres is giving us the Bennett version for Christmas and I can’t wait to book my ticket. Wonderful, wonderful, wonderful! You have captured, heart and soul, one of my very favorite books. I just re-read it (for the “umpteenth time) “The Wind in the Willows” a few months ago. I think it was when I was supposed to be spring cleaning, Claire. No matter. It is THE perfect book for anytime. Great review. I couldn’t agree more, Clare! I’ve several copies, and was devastated when my grandson didn’t like it — either the book or the movie. I had had such fond visions of us reading it together. So now I just read it by myself … and it’s none the worse for that! Yes, yes, yes. Wind in the Willows is such a lovely story. Thanks for reminding me how delightful and full of whimsy it is. I didn’t come to the book until I was an adult; I am sure I appreciate it better now than I would have as a child. I had best put aside the housekeeping and pick up with Rat and Mole again. “The Wind in the Willows is thought of as a children’s book but I can’t believe that children get any more pleasure from it than adults. ” I think that’s the mark of a truly great children’s book — a work of true children’s /literature./ I’m currently rereading some old favorites and those words seem incredibly applicable. I love the story, it was written about Kenneth Grahams childhood home, just a few miles from me. An enchanting part of the river. I know that I am late replying on this, but I had to. Wind in the Willows is among my all time favorite books. I first read it as a child even though I thought I was too sophisticated for talking animals and yet I fell in love with it. Your review is wonderful! It gets to the point. It is the characters that one gets so involved with that stay with you. Once read, Mole, Rat, Badger, and Toad are forever part of your life. Also as you put so well, the descriptions of the interiors become places comfortable and familiar. They are places where I want to return. Thanks so much for your review.